<< Back TAMIYA "Yamaha YZR-M1 50th Anniversary - Valencia MotoGP"
TAMIYA "Yamaha YZR-M1 50th Anniversary - Valencia MotoGP"
The striking white body with red stripe pattern was first used in the 70s, when the dotted red line was reffered to as a chain-block pattern. From the late 70's onwards, it was called block pattern, and later strobe line, and came to symbolize the power of Yamaha on the world racing stage. These traditional Yamaha Works colors were chosen to adorn the bike racing in the 2005 MotoGP final round in Valencia, Spain. 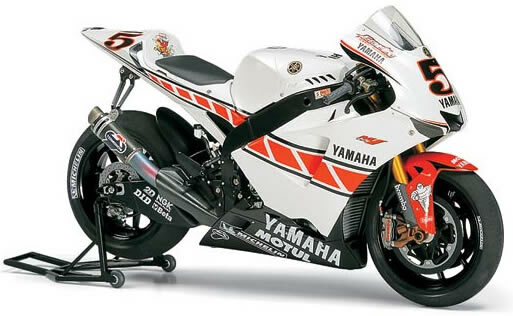 The improved and modified 2005 YZR-M1 helped Yamaha claim the Team, Manufacturers and Riders Championship for a truly memorable season. *Detailed 1/12 assembly model kit of the Yamaha YZR-M1 Valencia edition. *New parts faithfully render the YZR-M1 2005 model?s in-line 4 cylinder engine, main frame and rear shock unit, as well as cowling to accurately reflect differences with 2004 model. *Side and seat cowling may be removed even after assembly to display internal mechanics. *Realistic synthetic rubber tires feature Michelin tire logos. *Includes colorful decals to replicate red & white markings. *Markings depict bike No.5 Colin Edwards (Valencia colors).